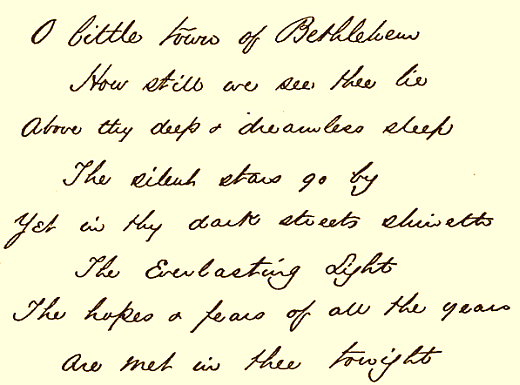 The manuscript above is the author, Phillips Brooks’ original first stanza. It was intended to be a short lived sunday school song. He asked his organist Lewis Redner to compose the melody and Redner procrastinated until the evening before it was due. He went to sleep and was awakened in the middle of the night by what he described as an “angel-strain” whispering in his ear. Seizing a piece of music paper he jotted down the tune and presented it in the morning for the Sunday service.